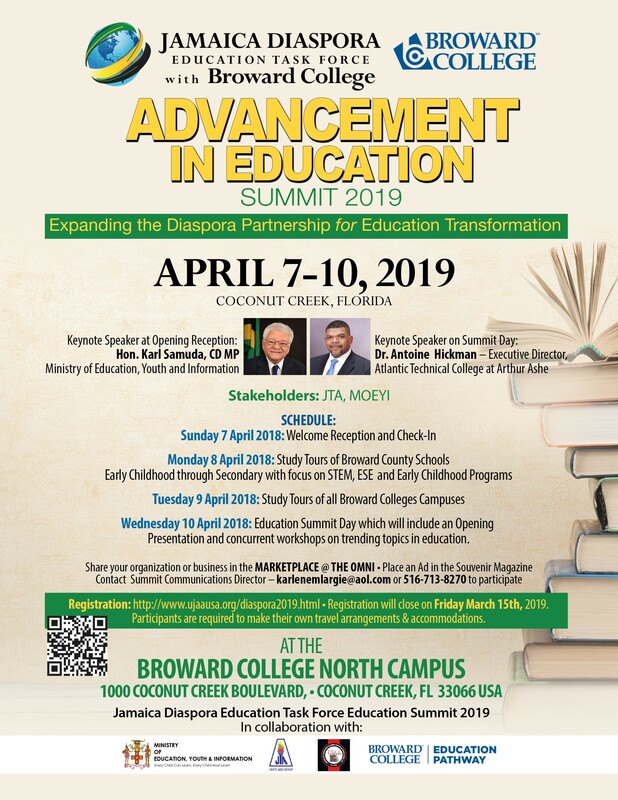 The Jamaica Diaspora Education Task Force (JDETF) and Broward College are poised and ready to host a delegation of teachers and educators due to arrive in Coconut Creek, Florida for their collaborative staging of the 4th Advancement in Education Summit 2019 from April 7th to 10th. It has been almost six years that the JDETF has used their Summit to gather like-minded professional teams to champion their commitment to support education in pursuit of realizing Vision 2030. This is the second convening in the USA. The partnership with Broward College bodes well for exchange opportunities for the college and the teachers in Jamaica, a pursuit of the volunteers paying forward for the advancement of education in Jamaica. Under the leadership of JDETF Chairman, Leo Gilling, a passionate team of educators, the active support of the Broward College Academic Affairs team, the Broward College Education Pathways organization, the Broward College International Education team and the Broward County Schools System, an exciting program is being planned. The components of this Summit are shaping up to present participants with an exciting series of educational activities. Teachers from all levels in the education arena are set to walk away with tools to improve their classroom leadership skills as they observe and engage with their host colleagues while participating in professional development opportunities. School tours, as well as tours of the three campuses of Broward College, enhance an innovative agenda items on the 4–day itinerary that covers Science, Technology, Engineering, and Mathematics (STEM), Early Childhood Education (ECE) and Exceptional Student Education (ESE). Among the invited speakers for the opening Reception that kicks off Summit 2019 are Minister Karl Samuda from the Ministry of Education, Youth and Information, Her Excellency Ambassador Audrey Marks, Hon. Oliver Mair, Jamaica’s Consul General to Miami and Professor Rosalea Hamilton, CEO of Lasco Chin Foundation. The JDETF Education Summits continue to enjoy the full and unconditional support of the Jamaica Teachers’ Association, the Ministry of Education, Youth and Information and the Ministry of Foreign affairs and Foreign Trade. Under the theme “Expanding the Diaspora Partnership for Education Transformation,” JDETF Chairman Leo Gilling has every confidence in the support base in the Diaspora that continues to play a key role in promoting the Summit that allows for Jamaican teachers to see and learn, and develop relationships that benefit their development.